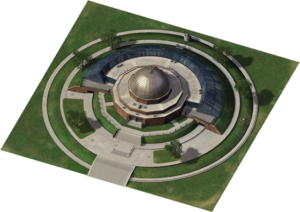 Adler Planetarium is a downloadable Landmark Building for SimCity 4 Rush Hour/Deluxe, released as the Plugin Pack 031 free Downloadable Content. It is a recreation of the Adler Planetarium & Astronomy Museum in Northerly Island, Chicago, Illinois as it appeared in 2003. The News Ticker fluff entry created on its placement is "#city# Sims Set Sights On Stars At Adler Planetarium". This page was last modified on 5 February 2014, at 23:24. This page has been accessed 10,916 times.